In this part of the series, we will dig deeper into webpack to see what else is possible. We will specifically try to use other webpack plugins in our application to work with images. In the previous part of the series, we have learned how to use plugins in webpack. We also learned about optimizations in webpack and how we can use some plugins as minimizers. We can use plugins to do many things while developing. In this article, we will consider a few uses specific to our application. When developing applications, we usually want to make our asset files smaller. Doing this will lead to smaller assets and thus a faster website. To achieve image compression, we will be using a webpack plugin called imagemin-webpack-plugin. Before we add it to the application, let’s see how this will be implemented in our config file. disable: this accepts a boolean value. If true, the plugin will be disabled. We would typically disable the plugin during development. pngquant: this accepts an object which will be the options for the imagemin pngquant plugin. To see the available options, check here. There are other options we can specify, you can see all the options here. One thing to remember though is, when you are adding other webpack plugins that work with images, you should always add them before the imagemin plugin. In this part, we will be building off the code in the previous part. If you don’t have it already, you can download the project code from GitHub. We will be using the code there as a base for the modifications we are going to make going forward. When you have downloaded the project, open Part-5 in your code editor and follow along. To get started, we need to decide the plugins we want to use and then install them using npm. After installing them, we will activate them in the webpack configuration file. file-loader - resolves import/require() on a file into a URL and emits the file into the output directory. Let’s start adding them one after the other. Above, we just added a new rule to the list of rules. We added the rule to look for images and pass them through the url-loader. The test we run for images is /\. (png|jp(e*)g|svg)``*$*``/ which will match images with the following extensions: png, jpg, jpeg, svg. limit - when the image file size is smaller than 8000 bytes (8kb), the image is converted to base64 format and passed as the src of the image. This helps save a DNS request and thus make your application faster. If the size is greater than 8000 bytes, the image is passed to the file-loader which will load the image normally. name - this is passed to the file loader in the situation where the file size is greater than 8000 bytes. Now that we have configured that, let’s download this icon and this icon from font-awesome. After downloading them, place them in the src/images directory. The icons we downloaded are both below 8000 bytes so we will use this to demonstrate the base64 URL that the url-loader generates. 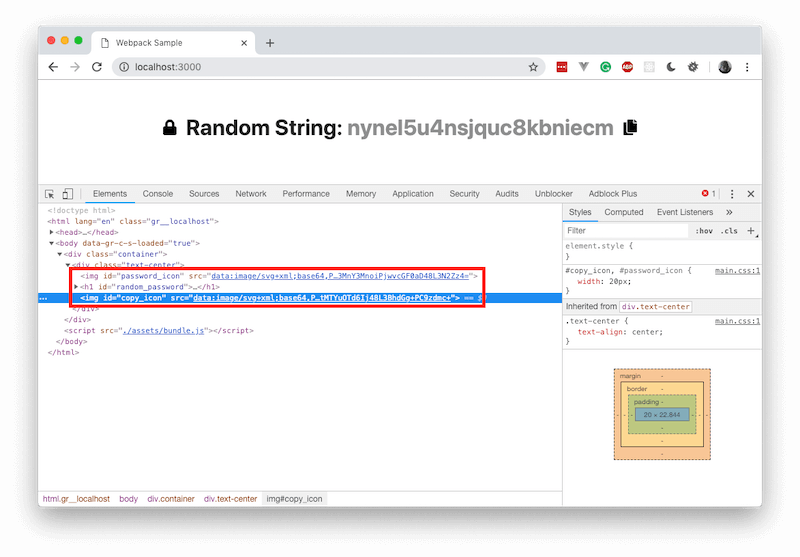 If all went well, you should see both images and if you Inspect Element and view the image source, you’ll notice it’ll be the Base64 representation. Before we demonstrate the other way url-loader handles images, let’s implement the copy to clipboard feature. The code above is just a function that copies the passed parameter to the clipboard. Now you can build the app and start the server if not already running. The copy to clipboard function should work now. 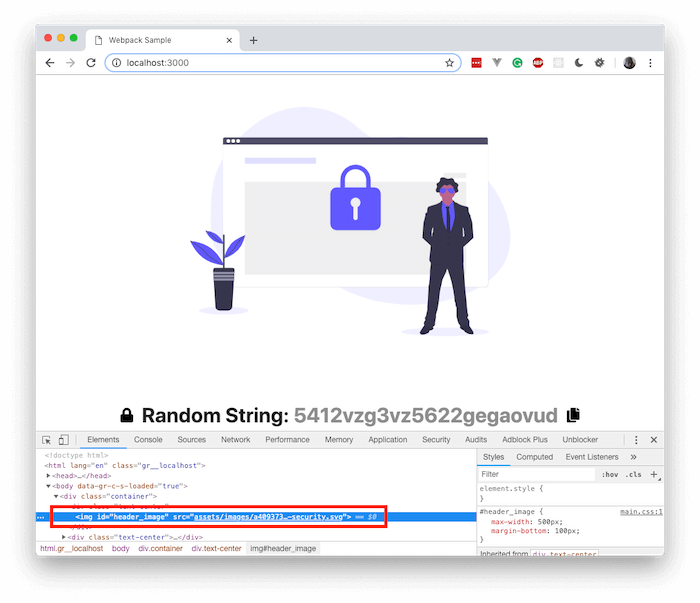 Now that we have demonstrated Base64 URLs for images, let’s demonstrate how larger images will be handled. Download an illustration from here and save it to your src/images directory. We are saving ours as security.svg. Above, we are using express to serve all the static files. If you had the server running before, you need to stop it and restart it. That’s all, we have our images compiled, compressed, and presented using our webpack plugins and loaders. In this part of the series, we have learned how to work with images in webpack. We learned how to compress images and copy them to our public directory using webpack. However, Webpack is a lot more powerful than this. We will dive a little deeper in the next part.